Our Mission Statement: By God's grace the Holy Spirit leads us to love and serve all. Christ Evangelical Lutheran Church, Staunton, VA was founded in 1853 originally holding services in a tavern. The first building was constructed at the corner of Beverley and Water Street now Beverley and Central Avenue and was called Central Lutheran Church. The original Town Clock was in that church steeple as a contract between Central Lutheran Church, the City of Staunton and Augusta County. The bell from the original clock, weighing 1,100 pounds, is now in the present steeple of Christ Lutheran Church on Augusta Street. In 1888, a new building was build on Lewis Street and the name was changed to Christ Evangelical Lutheran Church. That building served until 1959 when the decision was made to move to another location because of over crowding and lack of parking. 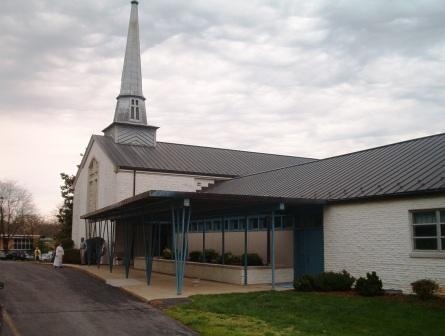 A new building was built at the present location, 2807 Augusta Street, in 1959 and serves the congregation with ample room and parking. In the past few years, a new copper roof has been added and a new Taylor and Boody pipe organ. The lower level has been renovated with new floors, ceiling, wall coverings and a new kitchen. Welcome to Christ Evangelical Lutheran Church, Staunton, Virginia. 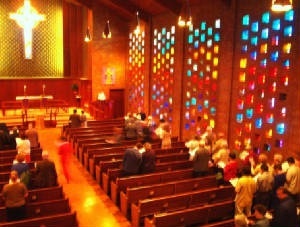 Christ Evangelical Lutheran Church is part of the Virginia Synod.